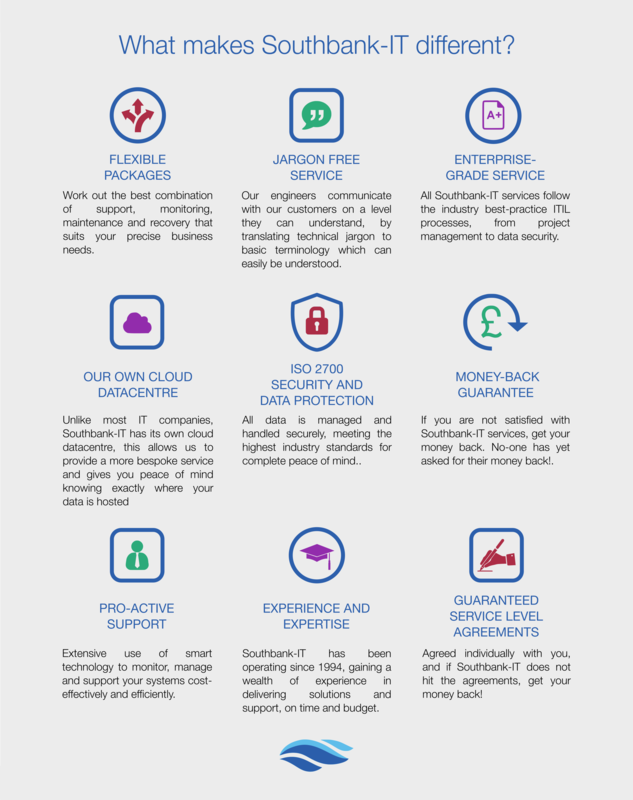 At Southbank-IT we believe IT Support should be about providing a bespoke service. We focus on providing competent professional IT strategic consultancy, support and telephony services to small and medium sized organisations. Established in 1994, Southbank-IT is an award-winning UK SME. We develop long term trusting relationships with customers; a recent customer satisfaction survey rated Southbank-IT 9.5 out of 10 for its support services. We continually invest in the latest technology, enabling us to provide secure cloud computing and advanced help desk automation, delivering a pro-active approach to supporting customers’ systems. Southbank-IT’s philosophy is first to understand our customer’s needs, we prefer to do this face-to-face so we can understand your personal requirements. We audit the existing IT systems to achieve a complete understanding of your company’s technical environment. Next, using the audit data, Southbank-IT recommends improvements designed to provide real business benefits such as enhanced security, reliability and availability. Once all of the systems are running smoothly and efficiently, Southbank-IT deploys automated tools and agent software to pro-actively monitor and manage the systems. In a world where IT is intrinsic to everyday life, the Southbank-IT team believes that intelligent use of IT is what sets organisations apart and helps them succeed in today’s competitive environment. In this world of limitless IT solutions if there is services that will help your organisation flourish, we will find it for you. See our Press Release for more information!